With just hours remaining before the steel exemptions expired, President Trump extended the deadline to give the NAFTA participants another month to cut a deal. In related news: Unifor boss Dias says it’s time to fight back on US newsprint duties; and Maine’s Governor is under fire again for his so-called “Canada-first trade policy“. In Wood product news: construction on Saskatoon’s first six-storey, wood framed building resumes after a fire; a six-storey wood building is going up in tandem with BC’s Site C Dam; Portland’s first high-rise wood building prefabrication includes the electrical system; and the first and largest CLT plant in the eastern US is nearly operational. Forestry topics of note include concerns about: Canada’s species at risk policies; overwintering fires in BC; community efforts to build wildfire resistance; and severe fires in Oregon’s plantation forests. Finally, discerning drinkers may soon be able tipple some cedar, birch and cherry beverages. Discerning drinkers may soon be able to branch out after Japanese researchers said Tuesday they have invented a way of producing an alcoholic drink made from wood. 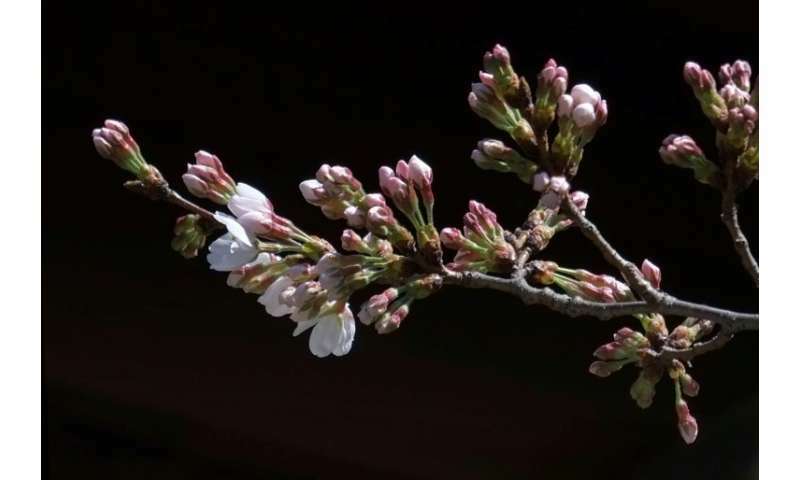 The researchers at Japan’s Forestry and Forest Products Research Institute say the bark-based beverages have woody qualities similar to alcohol which is aged in wood barrels. They hope to have their “wood alcohol” on shelves within three years. The method involves pulverising wood into a creamy paste and then adding yeast and an enzyme to start the fermentation process. By avoiding using heat, researchers say they are able to preserve the specific flavour of each tree’s wood. So far, they have produced tipples from cedar, birch and cherry. 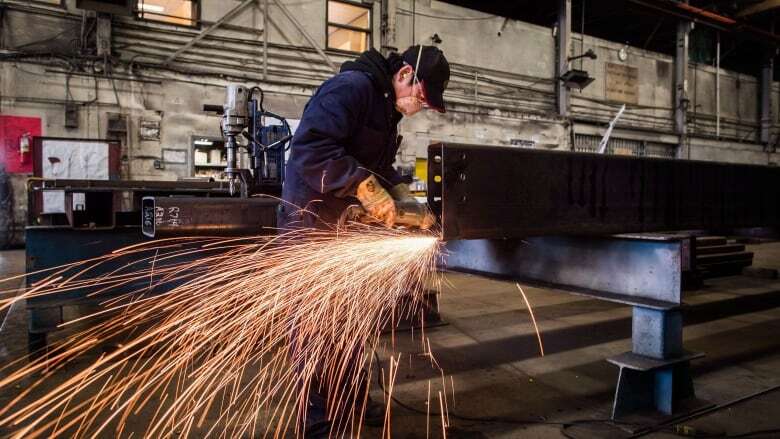 With just hours remaining before Canada’s exemption from new U.S. tariffs on steel and aluminum was set to expire, the United States postponed its decision on whether to impose the tariffs until June 1. U.S. President Donald Trump ordered sweeping tariffs in March of 25 per cent on steel imports and 10 per cent on aluminum, but granted temporary exemptions to certain countries. In the case of Canada and Mexico, Trump’s administration tied both countries’ tariff exemptions to the successful renegotiation of the North American Free Trade Agreement. Canada’s exemption period was officially set to end at midnight April 30. But late Monday, Trump decided to give Canada, Mexico and the European Union another month to work out a deal with the Americans. A single complaint from a paper mill in Washington state is putting Canada’s pulp and paper industry at risk, and it’s time to fight back, says Unifor’s national president. Jerry Dias warns that more than 1,000 jobs at paper mills in B.C., Newfoundland and Quebec are at risk as a result of American anti-dumping and countervailing tariffs. 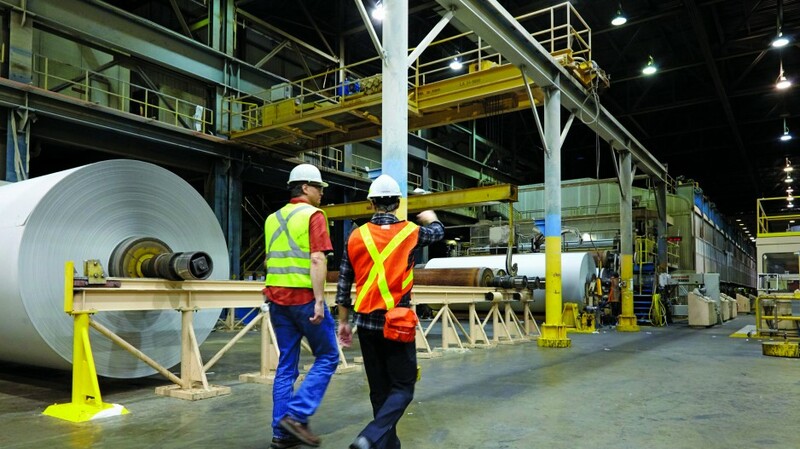 …Pulp and paper mills are major economic anchors for communities like Powell River and Port Alberni, where Catalyst Paper accounts for a significant portion of the municipal tax base and high-paying jobs. Unlike the lumber sector, which has been cushioned somewhat against softwood lumber duties by record-high lumber prices in the U.S., the pulp and paper sector in Canada – and particularly in B.C. – is not nearly as well insulated. 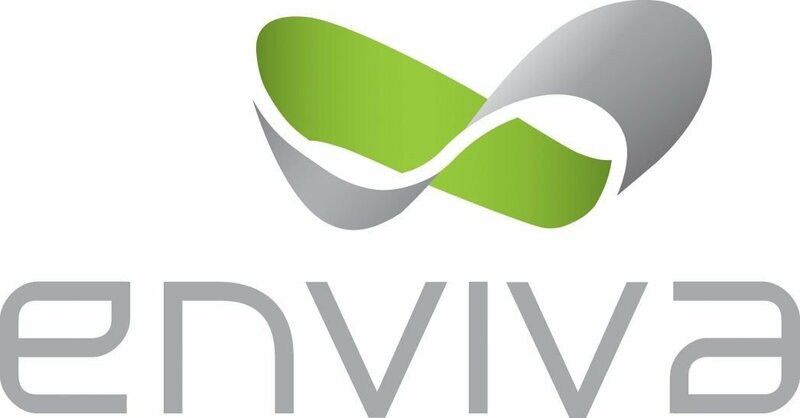 …“These tariffs, they’re really unwarranted, and they do come at a challenging time for us,” said Catalyst CEO Ned Dwyer. It was an emotional day in Woss as residents and workers gathered to honour the National Day of Mourning. The National Day of Mourning, held each year on April 28, honours those who lost their lives or were seriously injured in a workplace accident. The day is especially poignant for Woss, as April 20 marked the one-year anniversary of the Englewood Logging Train rail car accident that killed three forestry workers. …“Today is a really difficult day as we think back to April 20 last year. We remember those who suffered injuries and those we lost,” said Don Demens, adding, “Though we can never ease the pain or bring back the ones we lost, we can honour their memories by pledging our resolve to do whatever we can do to keep people safe. MAINE — The president of a Canadian-owned lumber mill that received shipments of timber cut from Maine public lands says he’s unaware of the equipment fire that Gov. Paul LePage has used to justify diverting those shipments away from another company whose owners have been critical of the governor’s stance on softwood lumber tariffs. …Fontaine’s comments come amid an investigation by Legislature’s watchdog agency, the Office of Program Evaluation and Government Accountability, or OPEGA. The probe was launched by the Government Oversight Committee this year after some lawmakers worried that the governor retaliated against the Brochus for saying last year that LePage was pursuing a “Canada-first” policy by joining Canadian officials in attempting to convince the Trump administration to create an exemption for some Canadian timber imports. It’s back to work at a hotel construction site gutted by fire earlier this month. On April 18, fire crews were called to the site … to find the top floors of the development engulfed in flames. The blaze was declared under control three hours later. The site is unique to Saskatoon as it’s one of the first six-story, wood framed buildings in the city. “The engineer was through to check the safety of the building and all the concrete is OK,” Ray Runtz, site supervisor for Sinewy Construction, said. “We have concrete walls on a wood frame building, and that saved a lot of the building.” According to Runtz, the concrete walls acted as a fire stop… …Cause and damage have not yet been determined, something fire officials admitted they may never get to the bottom of due to the integrity of the structure. A new 50-unit apartment building being built in tandem with the Site C dam is due for completion in December, BC Hydro announced today, and scheduled for tenant occupancy in January 2019. Construction on the six-storey building began next to the Fort St. John fire hall in 2017, and is part of the city’s agreement with BC Hydro over the Site C dam. The wood-frame building is being built to Passive House standards, and will be the largest Passive House-certified building in B.C. when completed, BC Hydro said. Portland will soon be home to the tallest wood building in North America. Project^, Home Forward, Walsh Construction Co, and StructureCraft are collaborating on the Framework building in the Pearl District, the first high-rise building made from wood in the United States. …EC Electric, the electrical subcontractor and a NECA/IBEW Local 48 member contractor, is using building information modeling (BIM) for this cutting-edge project. BIM, a three-dimensional design program, will allow EC to design the building’s electrical system virtually within the project’s digital construction drawings. EC’s design identifies exactly where notches and cutouts need to be placed in the prefabricated CLT floor and wall assemblies for the electrical conduit and wiring to pass through during construction. Based on Walsh’s master schedule and StructureCraft’s virtual construction models, EC will “prebuild” kits and modular systems that can be delivered to the construction site ready for immediate installation. What’s in the Treated Wood You Sell Today? It’s a question that comes up regularly in the lumber and plywood aisle: “Just what is in the treatments for preserved wood products?” That may be followed by: “And are they safe?” Preservatives have evolved since the 1970s, when preserved wood products were first sold in retail locations. Despite this evolution, there are still many misperceptions about preservatives used in treating. …One common misperception is that preservatives are poison. In reality, preservatives prevent fungi or insects from degrading the wood by creating a long-lasting disinfectant barrier. Copper serves as the chief ingredient. Today’s preservatives contain as much as 50% to 97% soluble or micronized copper. Most decay fungi, termites and other organisms don’t eat wood containing copper. DOTHAN, Ala. – The first and biggest cross-laminated timber (CLT) manufacturing plant in the eastern U.S. is nearly fully operational, with 25 employees currently working a portion of the plant. Florida-based International Beams (IB), a manufacturer of pre-fabricated i-joist beams, began converting a General Electric 227,000-square-foot into a highly-specialized CLT manufacturing facility last June. One portion of the main production has been installed – a wood grading component – in which technicians are currently learning the machines. The second portion of the plant’s main production line is arriving from overseas during the next few weeks and should be installed by June, company owner Bruno Lebel told the Dothan Eagle. The plant should be 100 percent operational by September and employ 60 employees in total. Building over hospital surface car parks could both help to cure the NHS’s key worker crisis and remedy its shortage of move on accommodation, a Stirling prize shortlisted architect told our Healthcare Estates Development Forum. Bill Dunster, whose Bedzed housing development in Sutton was on the shortlist for the Royal Institute of British Architects prize in 2003, outlined his proposals for making better use of the UK’s 1.2m surface car parking spaces. Under his practice’s proposals, the parking lots would be covered by rafts which lightweight units could sit on. 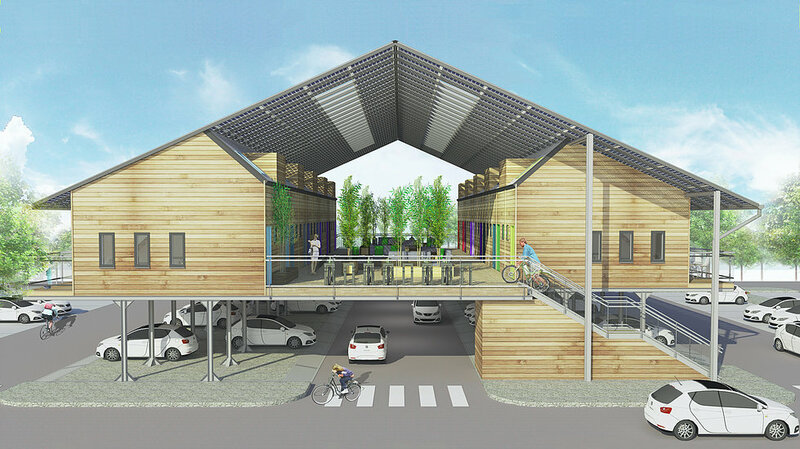 The rooves of the highlight insulated and cross laminated timber units would be covered in solar panels slashing their occupants’ energy bills, and each unit could either be used for housing or move-on accommodation for patients – big enough to accommodate two parking spaces underneath. Let’s file “Wood Wool” under new materials, because I’m hearing about it for the first time. Also referred to as excelsior in North America, these are soft wood shavings that are bound together by water and cement, creating a material that can be found in packaging, cushioning, insulation, and even stuffing teddy bears. 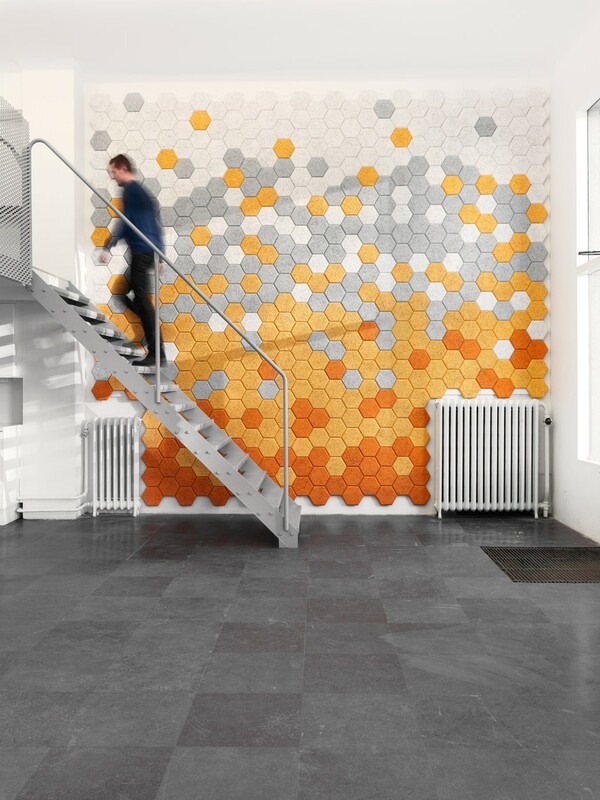 Form Us With Love elevates it with their series of 3D tiles that make for great interior decor. 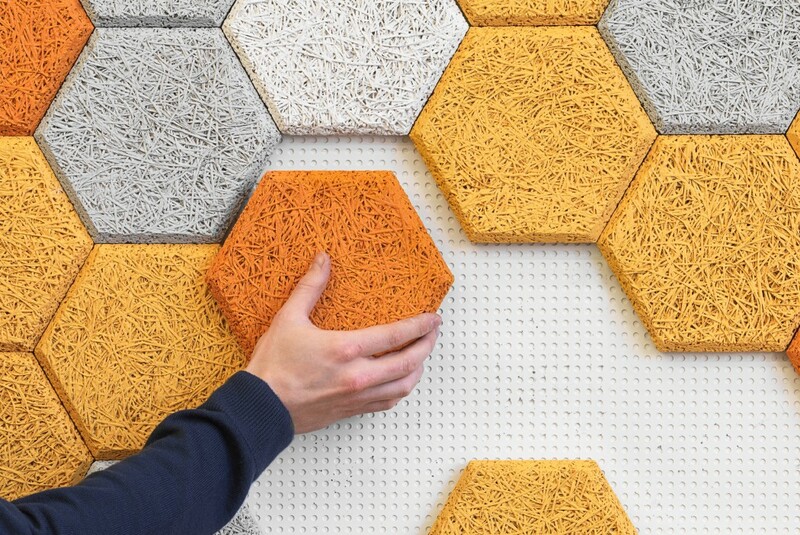 …Made from a product that one would normally perceive as waste, Baux employs wood shavings and wood wool in a manner that elevates the aesthetic of a household, making it a great tool for designers to decorate with. GUELPH, ON and EDMONTON – Starting on May 5th, municipalities from coast to coast to coast will join a national effort to reduce wildfire risk to local homes and environments in anticipation of this year’s wildfire season. A total of $47,000 was awarded to 94 successful community applicants across Canada for Wildfire Community Preparedness Day. This annual, national program was launched by FireSmart Canada in collaboration with The Co-operators, National Fire Protection Association (NFPA) and the Institute for Catastrophic Loss Reduction and has since gained support from the Provinces/Territories of British Columbia, Alberta, Saskatchewan, Manitoba, Ontario, Newfoundland, and the Northwest Territories. Communities can use their award from May through September to host Wildfire Community Preparedness Day events that will raise awareness, help protect homes, and encourage neighbourhoods to build wildfire resiliency. 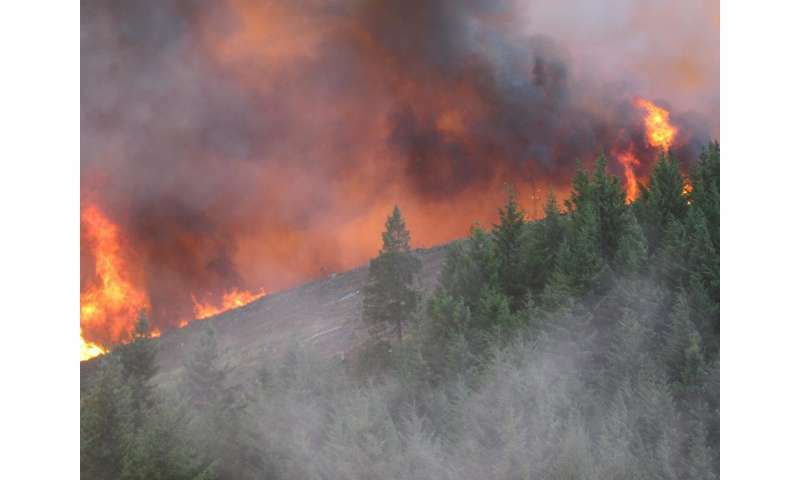 Emergency officials in British Columbia’s southern Interior warn that devastating wildfires that charred thousands of square kilometres of timber and bush last year now have the potential to make seasonal flooding even more severe. 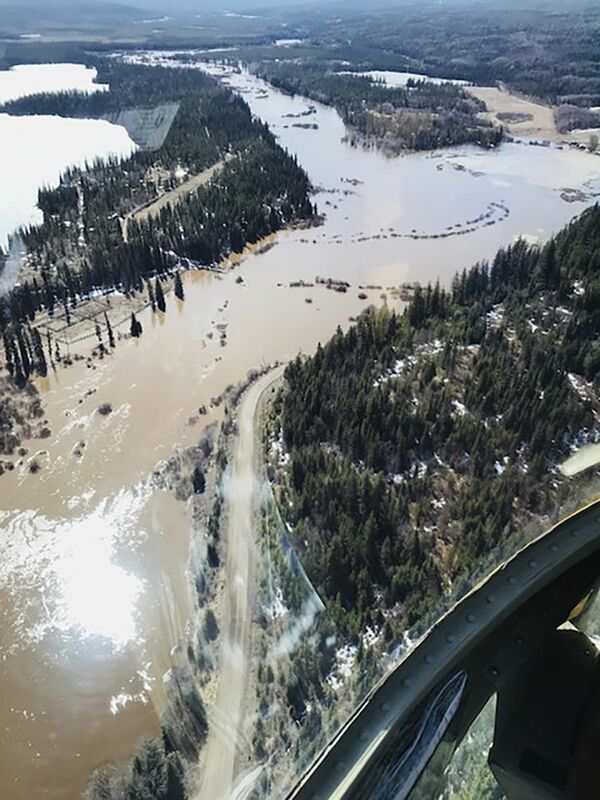 The warning from the Cariboo Regional District comes as about 120 properties were ordered to evacuate Sunday in the Upper Nazko region about 100 kilometres west of Quesnel. …“We are definitely seeing much more significant flooding than we usually do in our regional district and the experts at the River Forecast Centre and Ministry of Environment are advising us that a lot of this is due to the impact from the wildfires last year,” she said. More than 12,000 square kilometres of timber and bush burned across B.C. between July and September 2017, with the largest wildfire ever recorded in the province, called the Plateau fire, destroying a massive area west of Quesnel and Williams Lake. VANCOUVER—The BC Wildfire Service says some of last summer’s monster forest fires could still be smouldering deep underground and may flare up with little warning. So-called “overwintering fires” are the result of huge burns such as last summer’s Elephant Hill fire near Kamloops. They can continue to smoulder for weeks or months, sometimes popping up again in the spring when the snow recedes. “Last season, given the prolonged drought that we had and the severity of the wildfire season, because those fires burned so hot they were able to go deep into the organic soil layers,” said Claire Allen, a fire information officer with the BC Wildfire Service. The areas of concern include the Kamloops and Cariboo regions, which bore the brunt of last summer’s infernos. NANAIMO — More than 80 volunteers did literally tonnes of work cleaning up garbage in one of Nanaimo’s most popular mountain biking areas. 5.6 tonnes to be exact. The Regional District of Nanaimo, TimberWest, and the Nanaimo Mountain Bike Club (NMBC) held a clean-up at Doumont Trails on Sunday April 29, where 5,360 kilograms (5.6 tonnes) of illegally dumped garbage was trucked away. TimberWest’s Monica Bailey told NanaimoNewsNOW some of the items found were a car door, a fryer basket, a fridge and freezer filled with rotten food and diapers. …The groups and volunteers focused on 3 kilometres of the main Doumont Rd., as it’s what TimberWest calls the main access point for people to dump. 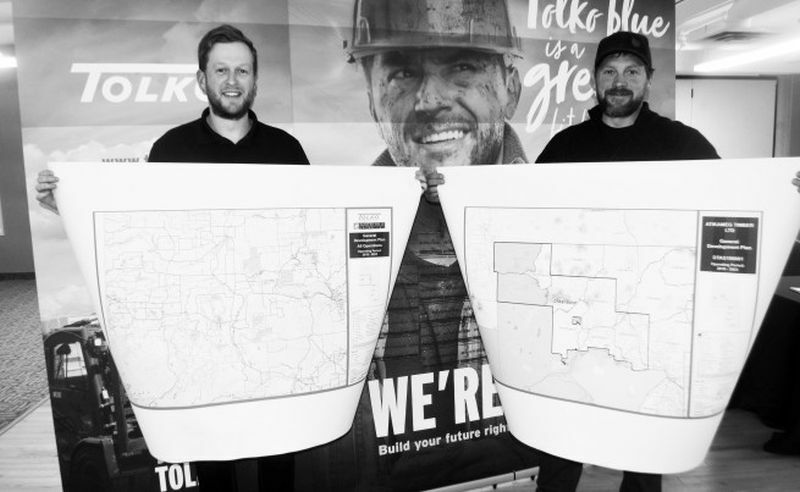 A general development plan for the Tolko OSB plant during the next five years was presented during an open house April 24. Tolko Industries Ltd. re-opened its OSB mill in High Prairie in full operation Jan. 2 after being closed in 2008. “These are proposed areas where we might harvest timber from July 1, 2018 to April 30, 2019,” says Tolko planning forester Sean Ellens. “We need to consult stakeholders to let them know where proposed sites are and to know if they have any questions, concerns or comments.” Tolko proposes summer access areas around Salt Prairie, southeast of Snipe Lake, Utikuma Lake in the Whitefish area, and an area south of Valleyview. The work would be done from July to November. A little over 20 years ago, a fifth of Vancouver was covered by trees. But since 1995, the city has been gradually losing its tree cover as properties are cleared for new developments. A report to the Vancouver board of parks and recreation notes that the urban forest canopy is “incrementally decreasing”. “…the recent accelerated decrease in urban forest canopy cover is primarily due to the loss of trees to urban development,” according to the report submitted by park board general manager Malcolm Bromley. The report prepared by Nick Page and Dave Hutch, …stated that the current urban forest canopy covers 18 percent of the city. …The update lays out a plan for urban forest management, which include increasing the urban forest canopy to 22 percent by 2050. Regional forestry companies attended an annual open house at the Allan and Jean Millar Centre on April 25 to present their various plans for this timber year. The companies included ANC Timber, Blue Ridge Lumber, Millar Western and Weyerhaeuser. They also held open houses in nearby communities. Oneil Carlier, Whitecourt-Ste. Anne MLA and agriculture and forestry minister, attended the open house to speak with representatives from each company. He encouraged members of the public to attend these annual open houses. …Dan Philippot, a planning forester with Millar Western, presented at the open house on behalf of the company. EGANVILLE – If Canadians do not actively manage our pristine forests, they are not only missing out on economic development but an opportunity to protect and preserve the environment for future generations. That was the message that Derek Nighbor, CEO of Forest Products Association of Canada, delivered to the Renfrew County chapter of the Ontario Woodlot Association during their annual general meeting last Saturday at the Eganville arena. The former Liberal candidate pointed out there is a misconception that harvesting of forests is bad for the environment. “The understanding of the role forestry can play not only in delivering good jobs but the environmental benefits like renewing habitat for wildlife, to preserve watersheds and to ensure the managing of pests,” said Nighbor. “This is a call to action. The province will have to wait a little while longer for an independent review of its forestry practices. The hotly anticipated report from University of Kings College president Bill Lahey—which will advise the government on environmental and economic improvements in forest management—is nearly complete but in need of some additional input. The province announced Monday via press release that Lahey will be subjecting the draft version of his report to advisors in international law and forestry economics before releasing it to the public. …It’s the second deadline extension for the “Independent Review of Forest Practices.” Lahey was originally scheduled to complete his report by March before the mandate was extended to the end of April. Wildfires show no respect for property lines, but a new analysis of the 2013 Douglas Complex fire in southwestern Oregon concludes that young plantation forests managed by industrial owners experienced higher severity fire than did nearby public forests. Researchers in the College of Forestry at Oregon State University used satellite imagery and local data to analyze the factors driving differences of severity in the fire, which burned about 50,000 acres north of Grants Pass. Located in the Klamath Mountains ecoregion, the area is dominated by Douglas fir, ponderosa pine and white fir and is a mix of private and federal ownership and state-owned O&C (Oregon & California Railroad) lands. …While fire risks may be higher on public lands than they were in the past, privately managed plantation forests in the Douglas Complex fire still tended to show greater fire severity than did forests on public lands. Arizona Gov. 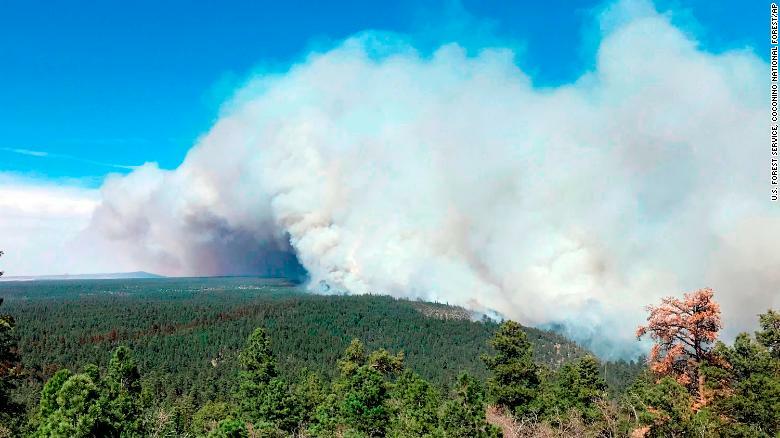 Doug Ducey declared a state of emergency Monday in Coconino County in response to the Tinder Fire. 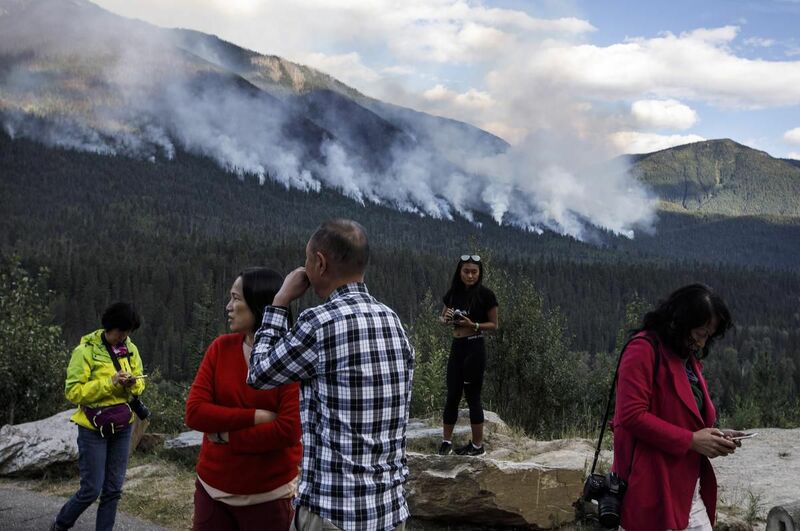 The fire has burned 9,009 acres since it began Friday, according to the US Forest Service. The cause of the fire is unknown, CNN affiliate KNXV-TV reports. “I’m issuing today’s declaration to ensure that they have the necessary resources to protect the lives, pets and property of Arizonans,” Ducey said in a statement. The Coconino County Sheriff’s Office ordered evacuations Sunday for communities north, east and west of Highway 87. The evacuations will be in effect until further notice, KNXV-TV reports. An evacuation site was set up at a Navajo casino resort, after being moved from a junior high school because of smoke. 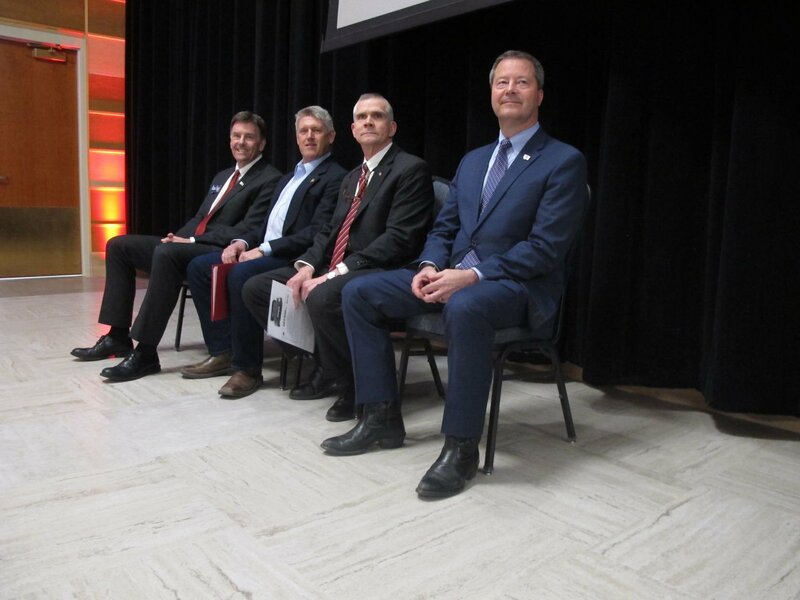 The four Republicans running in Montana’s U.S. Senate primary are unified on policies curbing environmental litigation and regulations, along with “balancing” recreation with mining and logging on public lands. But in interviews focused on natural resource policy ahead of June’s primary to decide who will take on Democratic Sen. Jon Tester, Big Sky businessman Troy Downing, former Billings judge Russell Fagg, Whitefish legislator and surgeon Al Olszewski and state Auditor Matt Rosendale drew distinctions on their experience, interest in protected lands and transferring federal lands to the state. In this story, which is the first in a two-part series, the candidates discuss Montana’s natural resource amenities and economy and the current state of public land management. When it comes to providing supply chain assurances, producing conservation outcomes, and supporting education and community engagement – Forests are the Answer. The 2018 SFI Annual Conference will explore this theme and engage you in a discussion focused on why Forests are the Answer to so many of the most important sustainability challenges we face in the sector and in our communities. The SFI Annual Conference brings together thought leaders and influencers: forest sector representatives, conservation and community partners, and Indigenous leaders as well as some of the most engaged forest product customers in North America. This year’s conference will discuss topics relevant to national and international initiatives across the forest sector. Come to the 2018 SFI Annual Conference to learn more and engage with the SFI community. Victoria’s Mountain Ash forest generates nearly all of Melbourne’s water. It is also facing “imminent collapse” due to a radical change in the ecosystem. The Australian National University are behind the discovery, with the release of a 35 year study that provides the first empirical evidence of the disastrous effects of over-logging. Lead researcher Professor David Lindenmayer, from the ANU Fenner School of Environment and Society, says wildfires combined with over-logging have tipped the Mountain Ash forest “very close to collapse”. “Collapse” of a forest is indicated by marked changes in the condition of an ecosystem – particularly the rapid decline in populations of key plants and animals. NEW ZEALAND — New plantation forestry regulations will better protect the environment while improving productivity within the forestry sector, Forestry Minister Shane Jones says. “The new National Environmental Standards for Plantation Forestry provide a nationally consistent set of regulations to manage the environmental effects of plantation forestry activities…,” Shane Jones said. “Forestry is our third largest primary industry but its efficiency has been hindered by variation in planning rules across New Zealand’s multitude of councils. …“From today that forest will be governed by one set of rules. “Greater certainty around the rules should encourage more investment in the forestry industry, providing a boost for regional economies. The regulations also create a consistent operating environment for any plantation forestry established under the One Billion Trees programme. 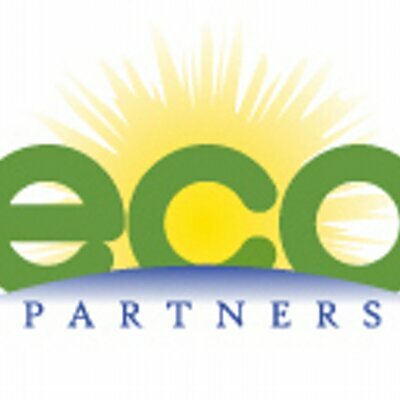 BERKELEY, Calif.–For the first time ever, small forest owners can now access the same carbon market as timber companies to sell carbon credits from their forests through ecoPartners’ platform Forest Carbon Works. This innovative technology provides an alternative for small forest landowners to broaden their revenues beyond timber and cultivate their forests’ ecological value with a fast track to the carbon market. By monetizing the forest as an asset, family forest owners – like Jon and Janice Stewart who are receiving approximately $10,000 annually – can now be paid to sustainably manage their properties. …Forest Carbon Works makes it possible for landowners to measure the carbon stored by their forests in as little as 50 acres using a smartphone app where previous measurement costs made participation too expensive. 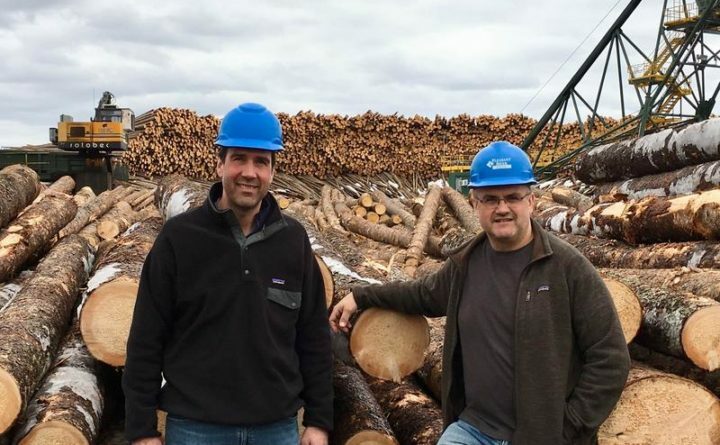 South Carolina — On the heels of a new report accusing the wood biomass industry of dodging federal Clean Air Act requirements, a Lakelands-based environmental advocacy group is pushing for tighter regulatory oversight on the state level. Last week, Lakelands Citizens for Clean Air sent a letter to Gov. Henry McMaster asking state leaders to “address the dangerous and unlawful air pollution emitted by wood pellet plants in South Carolina, including taking specific steps … to address existing deficiencies and to take proactive measures in the future to address new facilities.” …At the center of Lakelands Citizens for Clean Air’s concerns is a wood pellet production plant off Highway 246 in Greenwood County run by Enviva.